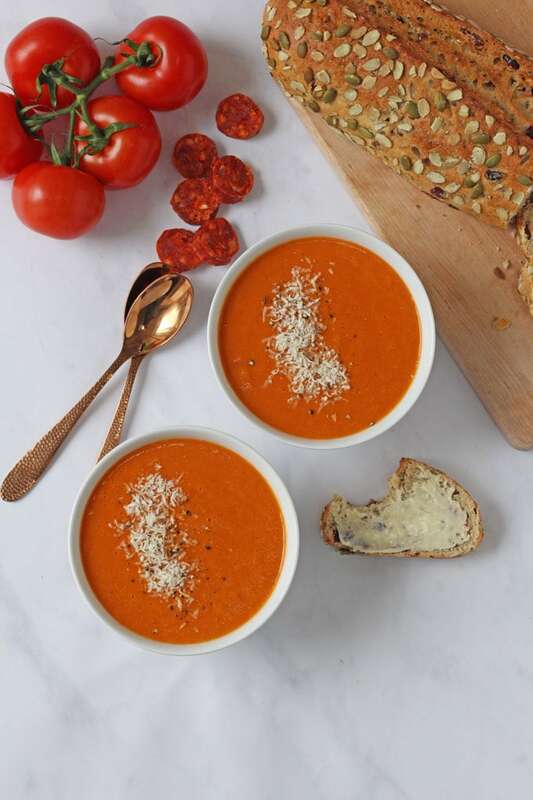 A delicious and warming Roasted Tomato & Chorizo Soup winter soup, made with the Braun MultiQuick 9 Blender. This time of year is most definitely soup season. When it’s cold and frosty outside there’s nothing better than cooking up a big vat of warming soup. 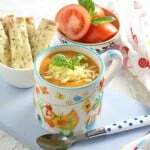 It’s perfect to whip up for a healthy lunch at home and will keep in the pot ready to be reheated for the kids dinner later in the day. 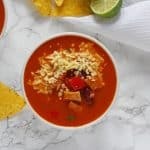 I’ve teamed up with Braun to show how you can make the most delicious Roasted Tomato & Chorizo Soup using their MultiQuick 9 Blender. This blender is an incredible addition to any kitchen. It’s designed for comfort and control with a powerful 1000 watt motor. 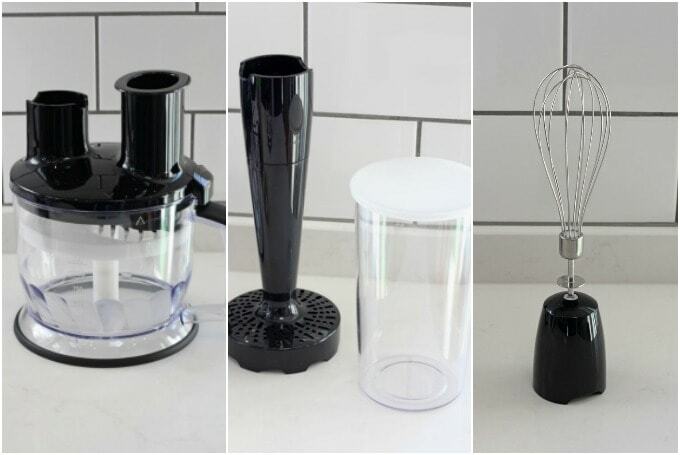 The MultiQuick 9 comes with a variety of accessories designed to turn the blender into a multi-functional kitchen tool. The 1.5L food processor bowl allows you to chop, slice, julienne and grate ingredients and also includes a kneading tool and french fry disc. There’s also a mini chopper, a masher, a 650ml beaker for blending and pureeing and a stainless steel whisk. You can add some extra herbs or spices if you like, but I find that by roasting the chorizo it releases so much flavour, so any extra seasoning isn’t needed. 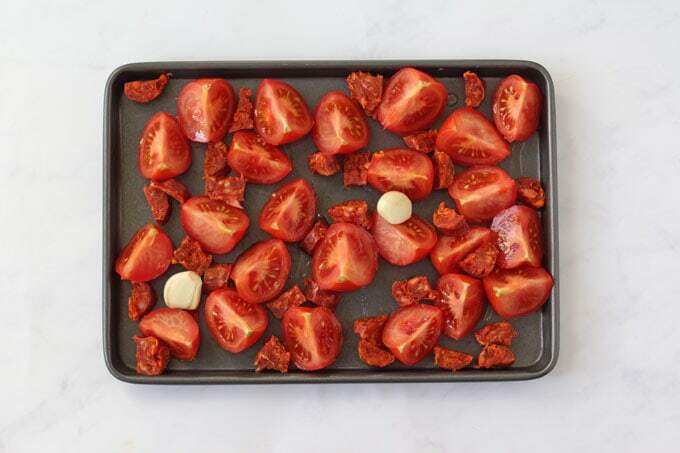 The first step in this recipe is to add the chopped tomatoes, chorizo and garlic to an oven tray. I drizzle over just a small amount of oil. 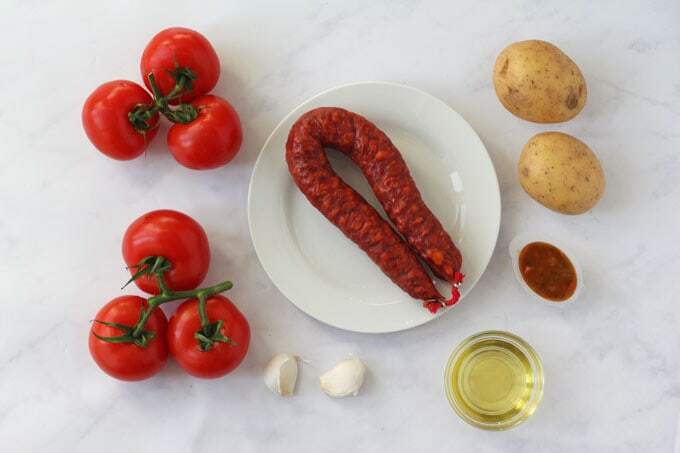 The chorizo will release its own natural fat as it roasts in the oven. After 15 minutes I transferred everything from the tray into a large saucepan along with the chopped potato (skins left on for maximum nutritioun!) and some vegetable stock. 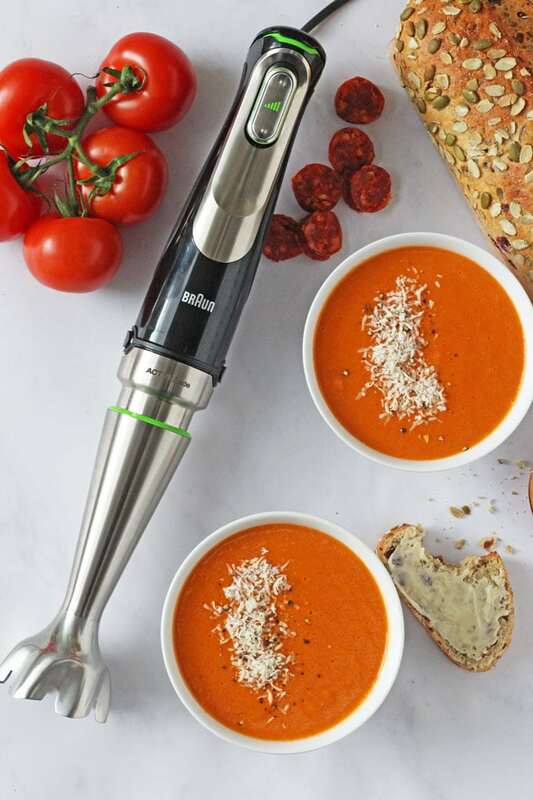 Once cooked, use the Braun MultiQuick Blender to blitz the soup until it is completely smooth. 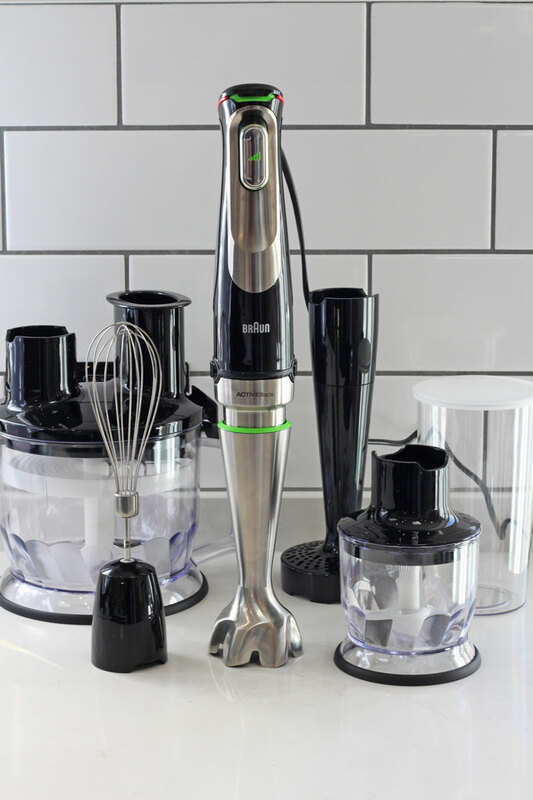 The smart speed function does away with the need for pre-set speeds as you simply adjust the speed and power of the blender by pressing the button down more. It takes no time at all to create a silky smooth soup with no “bits”. 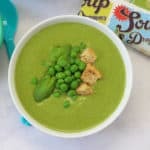 Perfect for fussy eaters! When ready, serve immediately with a sprinkling of parmesan cheese on top and with a couple of slices of rustic bread. 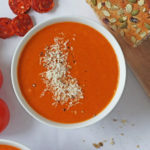 If you try my Roasted Tomato & Chorizo Soup please do leave me a comment and a star rating below. You can also share your pictures with me on on Instagram. I always love to see your creations! Disclosure: I have been compensated for my time spent working with Braun but all thoughts and opinions are honest and are my own. You can learn more about the Braun MultiQuick 9 Blender over on their website. Chop the tomatoes into quarters and add to a baking tray. Slice the chorizo into bite sized pieces and add that too. Peel the garlic cloves and crush with the back of a knife, but leave whole. Add them to the tray and then drizzle on the olive oil. Transfer the contents of the tray to a large saucepan and add the potato, chopped into bite sized pieces and also the vegetable stock. Bring to the boil and simmer for 12 minutes until the potato is soft. 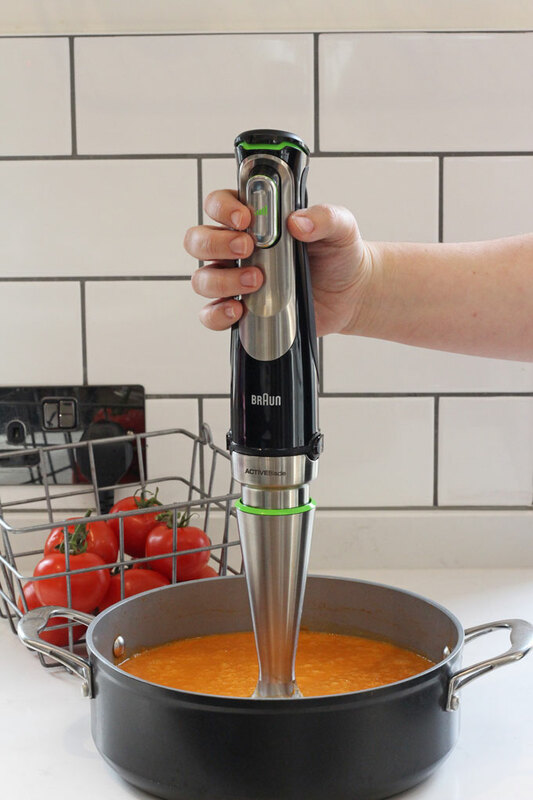 Use the Braun MultiQuick 9 Blender to blitz the soup directly in the saucepan until completely smooth. Serve immediately with a sprinkling of parmesan and some slices of crusty bread. 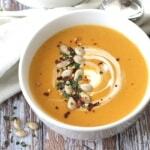 This soup will keep in an airtight container in the fridge for up to 48 hours. It can also be frozen and defrosted overnight in the fridge.